Antenna Theater’s complete production archive is under development. For more information about this production, please contact Annette Rose. ​Many folks when thinking of the Golden Gate Bridge tend to focus on the amazing technological feat that culminated in this spectacular suspension bridge –the height of the towers, the length of the cables, the amount of rivets. Unbelievable! And yet on this 75th anniversary of the Golden Gate Bridge we would like to propose another way to view the bridge; not only as a stand-alone man-made marvel, but as a part of our environment. 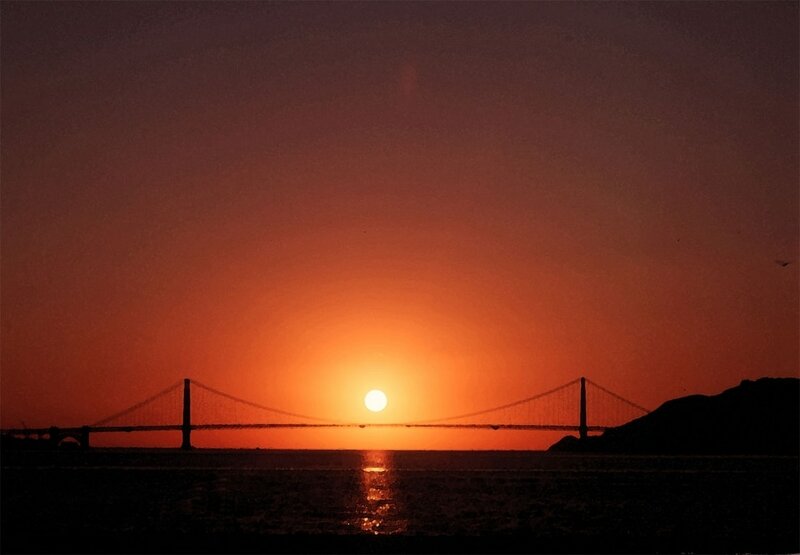 The Golden Gate Bridge is not just a bridge, but a bridge that bridges the Golden Gate of the Western sun. Therefore we invite you to look again and this time see the whole picture, the bridge, the straits, the headlands, the presidio, and the pacific ocean. The Golden Gate Bridge relates to all these, but it is directly connected to the entire universe through the sun. The purpose of our Golden Gate Bridge Sundial Project is to reveal this amazing connection by showing that the Golden Gate Bridge can function not only as a bridge but as a sundial.